There are some very smart people around….and thanks to the joy of the internet (specifically YouTube and Twitter in this case) we get quick and easy access to their thinking. Not that trawling through indexes in a reference library isn’t fun of course, but it’s a lot more time consuming! The specific smart people I am referring to in this post are Marc Ventresca and Grant McCracken . The first is on staff at Said Business School in Oxford and the second is on staff at MIT as well as writing books & blogs. Ventresca ran a session at the recent TEDx in Oxford, the subject of which was Entrepreneurs and it was through McCracken’s blog on HBR that I came to see this session on YouTube. For those who want more than my perceptions, it’s linked here. The beauty of a TED talk is they are punchy. 20 minutes maximum and given the diversity of the audience rarely rely on a great deal of in-depth knowledge of the specific area. Ventresca opens his by asking people to reflect on the word entrepreneur and what it has come to mean. He goes on to give what has evolved into the mainstream perception of entrepreneurs, the way it has been ‘captured’ – those who take big risk for big reward, those who are endlessly persistent, those who do things no one else will do and those who are free from the bounds of convention. This is where I got really excited (sad I know) because actually to me what he was describing was not just entrepreneurs but more importantly to me, given the context of my research and reading, he was describing corporate entrepreneurs. Not the maverick celebrity special few, but a definition and understanding that could apply to people within organisations. The phrase he used that was particularly resonant was, “start with what they have at hand” to “turn what they have in hand to something more” but most resonantly for the consideration of corporate entrepreneurs “they do something in the world they’re in”. It’s in these 3 things that I started to think about the differences between corporate entrepreneurs and other successful business managers. I would imagine every successful manager understands the elements around them but the two things that maybe distinguish entrepreneurs is firstly the ability (or creativity in its broadest sense) to combine them but also the ability to recognise the potential in the difference between the (heterogeneous) elements. Also, given how hard people seem to find it to recognise or admit they are entrepreneurial, without being in a start up or small business situation, this definition could be very powerful in helping increase the identification of relevant individuals within organisations, the growth of venturing within businesses and a return to economic prosperity…but I may be taking this a little far! N.B. Any errors in the transcription from the YouTube clip are mine and apologies in advance to Dr Ventresca if I’ve taken his words in vain!! Back in the days when I did my CIPD qualification (a long time ago – the best grade in GCSE was still an A and newspaper retained Investigators were still going through bins) the phrase everyone was espousing was “HR as a business partner”. You may have heard it…. 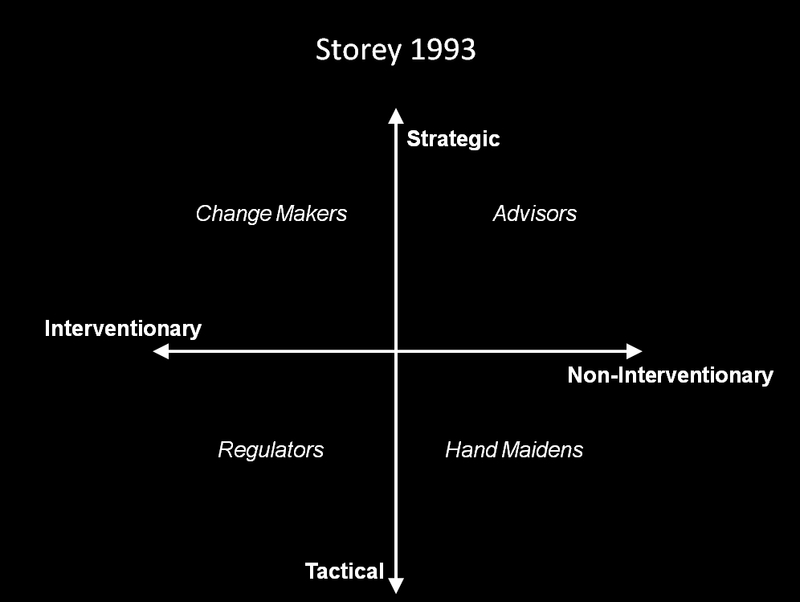 In studying models of HR practice the few that stuck in my mind (in fact I think I learned them by rote for a potential essay question) were by Tyson & Fell and Storey. “(i) The clerk of works – all authority for action is vested in line managers. HR policies are formed or created after the actions that led to the need. Policies are not integral to the business and are short term and ad hoc. Authority is vested in line managers and HR activities are largely routine – employment and day-to-day administration. (ii) The contracts manager – policies are well established, often implicit, with a heavy industrial relations emphasis, possibly derived from an employers association. The HR department will use fairly sophisticated systems, especially in the field of employee relations. The HR manager is likely to be a professional or very experienced in industrial relations. He or she will not be on the board and, although having some authority to ‘police’ the implementation of policies, acts mainly in an interpretative, not a creative or innovative, role. Look kind of familiar? It will do because lo and behold 5 years later, what appeared but this….. Yes the mother lode of Dave Ulrich and the phrase “HR as a business partner” was born (and 27,000 fairies died). 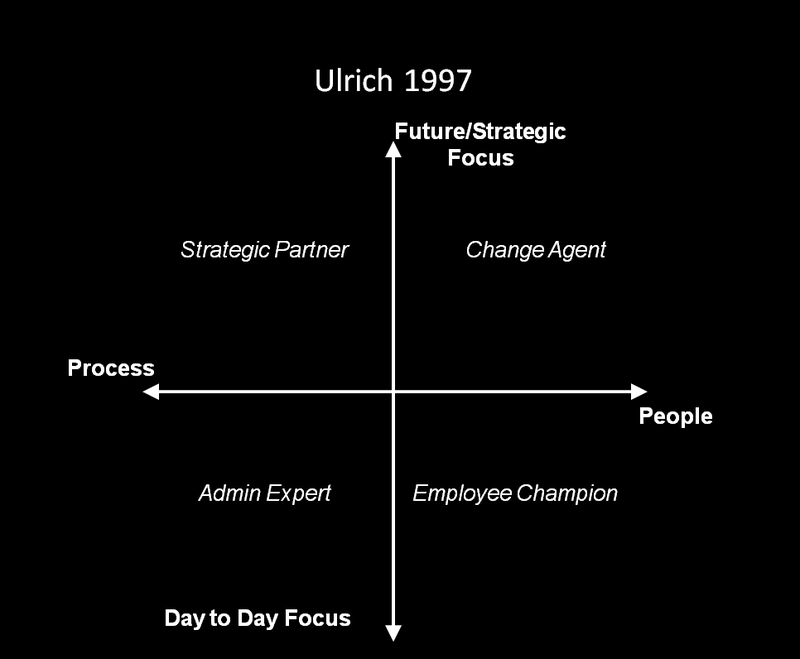 Don’t get me wrong I am not one of the Ulrich haters but like any model it should be taken in context and not taken completely literally. For what it’s worth my view on models? They provoke thinking to consider what you are currently doing differently. They are not a recipe book to be ‘cooked’ verbatim. This brings us to my point…. “HR as a business partner”. If you stick HR business partner into any job board you will get loads of adverts with a huge range of salaries doing a whole range of things at a vast range of levels. It had become a catch all job title but are any of them truly business partnering? If you talk to someone who runs a small business and they talk about their business partner I doubt they talk about someone who polices them, tells them what they are doing wrong and runs their payroll. That is what their office manager or in some cases their book keeper does. Their business partner will have skin in the game. Their business partner will be vested in the business (usually financially) and will be to some degree, depending on the partnership, accountable for the results of the enterprise. How many HR business partners could claim that? I truly believe (otherwise I would be doing something else) that HR can have a powerful role in the business. That positioned correctly, invested in properly and filled with courageous and knowledgeable practitioners, the HR department can be a true business partner (in the way described above). But can we please please stop kidding ourselves that we are anywhere close. Rather than focussing on the rhetoric and coolest new model, can we start working to make some of those already in existence effective….please! For at least the past decade discussion has abounded about the war for talent. When I first interviewed for an HR job a friend who is a Senior HR practitioner told me to avoid using the phrase as it would sound like meaningless jargon. I followed her advice then (and got the job) but continue to see the phrase in print (online and offline) and featuring on many conference programmes. It appears with my limited perspective that the biggest focus in the war for talent, or least in the discussions I see is the acquisition of talent (recruitment in normal language). Whilst ensuring an organisation hires great people is absolutely key in ensuring the health and effectiveness of the organisation – it is only a battle, it is NOT the war. What largely seems to happen is that line managers are asked to assess their teams and fill in some form of document or chart with an indication of what roles that individual will do in a specified amount of time. Now I accept there are some organisations that do this very well but it appears most do something rudimentary. This list could go on and on and as previously stated isn’t a view on the best practice that exists in some organisations but my perception on what happens in some organisations that maybe haven’t seen (or been influenced to) the value of investing in their succession plan. Views abound on many parts of this subject and an interesting view from the other side of the fence can be found in this post from Katie McNab. People don’t appear on a balance sheet. If they did you would have to depreciate them, give information on their expected life span and what investments are being made to ensure that life is achieved or exceeded. Whilst a machine in a factory receives planned and preventative maintenance and effort is put into the next generation of upgrades, additions, capacity extensions and ensuring that machine runs as efficiently as possible. Due to the lack of objective (and for that read financial) measures around people it appears they don’t receive the level of attention they would benefit from. So why did I write this? Firstly because the thought has been bouncing around my head but probably more to ask that the next time you hear/use the phrase the war for talent you think about all the battles on all the fronts and how important your existing employees are to the future success of your business. For those of you who know me, you may well know that I do a weekly show on a hospital radio station near to my home. It’s every Sunday night and I have the privilege of doing it with a couple of friends so it’s generally a great laugh and a fabulous way to end the weekend. The show has a dedicated Facebook group which allows people listening on line to take part in and comment on the show. The tone is light hearted and a fair amount of ummmm Michael is extracted often at my expense. It’s great! A few of our loyal listeners are more than happy to express their opinions about the music played and in turn request something more to their taste and on occasion we relent and play near enough what they ask for. In the early part of the show last night such an occasion arose and I said, on air “Well you can please some of the people, some of the time but not all of the people all of the time” (nods to Abe Lincoln) but added “but in our case often none of the people, none of the time” or words to that effect. The comment was off the cuff and we quickly moved on…but it got me to thinking…. In the course of my Masters degree and in my job the training cycle comes up. You know? The classic cycle – Establish Need, Design, Deliver, Evaluate. Yes, that one. And if you read the books on establishing needs in training you’ll often see the phrase “training needs analysis” coupled with suggestions around collecting training needs through personal development planning process. It is often suggested this is coupled with appraisal so short falls in objective attainment are tackled through personal development plan. Robert’s your father’s brother – job done. Or is it? The bigger problem (hard to reach fruit?!) of the problem with this approach is that what you are collating (because there’s little or no verification in this process) is a list of wants… Not needs! In the few instances I have been either a participant or managed this process the gap between what people want and what potentially they could need is at best wide at worst gulf like and what seems to happen is a list filled with those classic “performance game changers” (coughs loudly) like ‘Finance for Non-Finance Managers’, ‘Time Management’, ‘Presentation Skills’ and ‘Project Management’ appears. That’s not to say those are not important topics. Indeed our finance team would attest to my need to attend at least two of them BUT are they the things that are actually going to shift organisational performance? So where is this going? I am NOT saying that if you are part of or responsible for this type of process that you should NOT ask for or provide the things you/they want. Not saying that. What I am saying is that whatever your role in understanding the development needs of an organisation, take a step back and ask yourself a question…something along the lines of “what knowledge, skills & behaviours are going to significantly change our business performance?”, maybe ask around, talk to some people at different levels and perspectives in the organisation and then sense check it with what has come before and the challenges that lie ahead. I imagine that your answers to that question will be as informative if not more so than a drawn out information collection process. I also imagine that the answer to the question won’t be finance for non-finance managers! Actually about a year ago in an office about 20 miles from where I am sat, I had a problem with my laptop at work. I had just returned from an overseas trip and it apparently was no longer “part of the domain”. Being a well schooled user of corporate IT I checked the network cable and switched it off and back on again and nothing… At the time I was 25 minutes away from a 1 to 1 with my boss, my phone was ringing and in a delegatory moment I asked our team administrator if she would mind calling IT and asking them to sort it out. In the following minutes whilst on another call I heard the following “but don’t you know who it’s for?” and my blood ran cold. I like our IT team, they have a real customer service mentality, care about their metrics and deal with everyone fairly and with equity, and so the idea that our well meaning administrator was trying to using the (somewhat questionable) power of my job title to get this sorted really bothered me. A wise man once said (actually it’s a supplier who was informally coaching me at the time) that every time you refer to your boss or a senior person when discussing a decision or course of action that what you are signalling to the other person is a) I don’t have any power or influence here and b) I am using their proxy to drive this course of action. This really bothered me also. Both in a professional sense but also in terms of my personal pride and view of myself in that organisation. It made me stop and reflect how many times I had opened a sentence with “I’ve been speaking to Clare and…” or “Clare and I have discussed this and…” thus signalling I was the monkey and Clare was the organ grinder. How many times do people you work with in your organisation making emphatic reference to a senior person when trying to make a point? It’s a lot isn’t it? 3. The senior person had made a cursory comment about the course of action but their team member had a strong view which was being backed by the cursory comment. Fortunately for our organisation (although not necessarily for my objectives!) the majority of the references fell into item number 1 and required a trip to the drawing board. However on the odd occasion that the others on the list snuck out, it was very interesting to try and resolve the issue and also understand the dynamics that were driving the behaviour. How often and how severely have you come up against numbers 2, 3 & 4? What are the context/behaviours you think may drive that?